A spectacular and timeless adventure, "Grand Canyon: The Hidden Secrets" takes audiences on an in-depth exploration of one of the world's most extraordinary sites. Winner of the 2000 IMAX Hall of Fame award and seen by over 220-million people, this giant screen film captures the Grand Canyon's immense beauty, giving viewers a unique chance to forge the canyon's depths and experience what they could never see on their own -- from a thrilling flight over the canyon's span to a wild whitewater-rafting ride. 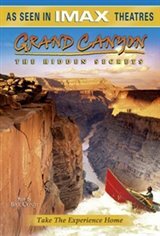 Viewers also gain a unique understanding of the canyon's awesome history, discovering everything from the original Native American inhabitants to the great explorers.